These are demonstation widget programs of various sorts. COLORBUTTONBITMAP Creates a true-color bit map for creating colored widget buttons. CW_DRAWCOLOR A compound widget used to select an individual color from a color rectangle or patch. FSC_DROPLIST A replacement for WIDGET_DROPLIST with easy Get/Set Value capability. FSC_FIELD A replacement compound widget for CW_FIELD. Similar to FSC_INPUTFIELD. FSC_FILESELECT A file selection compound widget. FSC_INPUTFIELD A replacement compound widget for CW_FIELD. Written as an object. TEXTBOX A simple pop-up (or modal) dialog widget that returns a text string. XMOVIE Correct implementation of a widget annimation loop. This simple function creates a true-color bitmap that can be used to create a colored widget button. I used the following code to create the figure below. The purpose of this compound widget object is to allow the user to click a small color patch or rectangle and have a new color selection dialog widget appear so a new color can be selected. The functionality is demonstated in the Coyote Program cgPickColorName. The purpose of this compound widget object is to provide an alternative to the droplist widget (Widget_Droplist) offered in the IDL distribution. What has always annoyed me about a droplist is that you can’t get the current “value” of a droplist easily. This compound widget makes this and other tasks much easier. 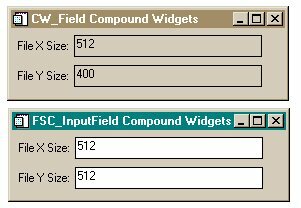 This compound widget is designed as a more-or-less drop-in replacement for the RSI-supplied CW_Field program. It is an ill-conceived precursor (which I have tried desperately not to support) to FSC_INPUTFIELD. If you aren't really sure about objects, use this program instead of FSC_INPUTFIELD. If you are ready to go for it, use FSC_INPUTFIELD, the officially supported version of these two similar programs. This compound widget is designed as a more-or-less drop-in replacement for the RSI-supplied CW_Field program. There are several things I have never liked about CW_Field, but the the foremost thing is that on Windows machines the text widget input box is grayed out and does not look as if it is editable. Without this visual clue, users are confused about how CW_Field works. This program is more flexible and powerful than CW_Field. One of the ways it is more powerful is that it is possible to set the fields up so that users can tab from one field to the next and have the text in the fields automatically selected for editing. An example program at the end of the code shows you how this is done. Compile the program file first to run the example. See Writing Pop-Up Dialog Widgets for a discussion of this program. A simplified XInterAnimate program that shows you the correct way to implement an animation loop in a widget program with a Widget_Timer event.